Conflict is inevitable. It is part of the human condition - but there is hope for the wounded Power Exchange Relationship. No matter who you are or what your background is – at some point you are going to come into conflict with someone you’re in relationship with. The pain of serious relationship conflict can motivate us to seek relief in ways that are inadequate or even harmful to the fundamental needs of the M/s dynamic. When faced with discord many M/s relationships implode under the weight of discussion, or suffer in silence through chronic conflict avoidance. Frequently, explosive confrontations are the damaging result of frustration on both sides, or people just give up and go their separate ways, only to repeat the same patterns in the next relationship. 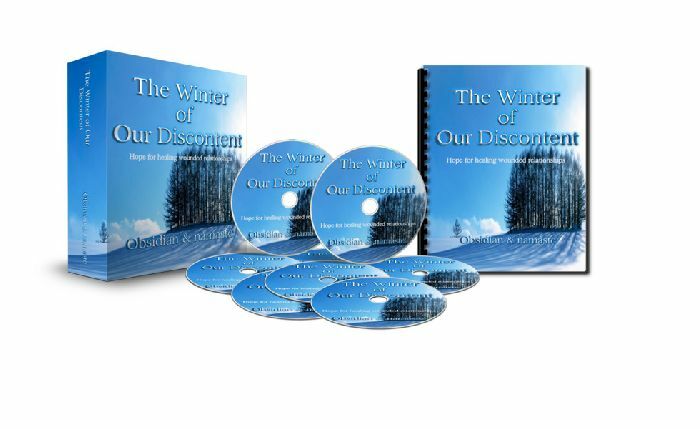 We created The Winter of Our Discontent for anyone that has experienced conflict in their P/e relationship to help them get on top of the issues and get on the path toward healing. This course is also an excellent discussion starter for anyone to use to surface and address any potential relationship landmines long BEFORE they become issues. We've taught Winter in front of hundreds of people across the country and it continues to be one of our most requested classes - now you can enjoy this course in the privacy of your own home so you can make your relationship even stronger! Just a few of the things we cover in The Winter of Our Discontent; Learn the two main reasons why we tend to self-destruct during relationship conflict..and three amazing things you can do right now to make sure you communicate without escalating tension. Understand the responses that are 'hard-wired' into our genes that tend to work against our successfully resolving conflict and simple tools you can use to change these negative tendencies into positive relationship assets. The most critical 30 seconds of any serious relationship discussion and how to use this time to cut through to the heart of any issue. The three stages of relationship conflict, and how to keep things from getting worse when you want them to get better! Six must-have, essential ingredients that are critical and necessary to have present BEFORE you even start talking. The three things that submissives and slaves can do that are incredibly effective in getting the attention of the Dominant or Master without being disruptive or disrespectful. Timing is everything - know the absolute best time to begin having a serious discussion. How to avoid communication illusions that can take your eyes off of what is important during a tense discussion. The magic of story and how you can use this method to encourage openness and deeper levels of communication. With over 40 years of combined lifestyle experience, Obsidian and namaste have created a number of creative, practical and repeatable techniques for both parties in the Power Exchange relationship to communicate serious concerns through a process that is designed to respect, strengthen and perpetuate the Power Exchange relationship, instead of temporarily abandoning the P/e structure to use an ‘egalitarian’ problem solving model. Join us on an exploration of practical conflict resolution methods based upon ancient principles. Whether you are in the middle of trying to resolve conflict or not, there is something valuable here for everyone. Both sides of the slash will come away from this class equipped with tools to assist in tackling tough relationship issues without sacrificing the Power Exchange relationship in the process!!! This class includes 6 Videos plus a reading list and downloadable MP3 files so the class can be downloaded onto your phone, tablet or mp3 player! !